And it appears a scene set back pre-nuke, which is... interesting. Apparently this bit confirms that it takes place in Boston. Anyone from that area wanna confirm? That's clearly the Paul Revere statue, so yeah. Also the state house dome at 2:03. Also looks like the baseball stadium has been turned into a town or something at 1:50.
edit: your airship is the USS Constituion. SirBryghtside wrote: Yeah, this should be good. Most interesting part of the trailer, to me, is the hint at player voice acting at the end - that's unprecedented for Bethesda. Yeah; I'd prefer if they didn't have voice acting for the player, but it's not exactly a dealbreaker for me. 1) Bethesda isn't very good at writing RPGs anymore. They're far more on the fuzzy logic end of fantasy, telling pretty generic fantasy stories that often subvert your expectations (twist ending). Even the subversions are kind of predictable, which directs them towards doing a double subversion. When they do try to do heavier or less fluffy stuff, it's kind of half-assed (skyrim civil war for instance). Obsidian are arguably the best story writers in the industry, New Vegas was one of my favorite games. I think it blew Fallout 3 out of the irradiated water. I'm not a big fan of the theme park style RPG, but I have to say that this does look like a far more interesting theme park than DC. 2) Gamebryo, Gamebryo never changes. It doesn't handle the whole first person shooter thing too well. Animations are stiff, ironsights don't always line up partly because of laziness and partly because of the old style of hitscan. All of those little details that are very difficult to notice in CoD or Battlefield that make shooting stuff enjoyable are missing because the engine is ancient. It doesn't have the framework to easily add those features. It's probably a programming nightmare. I give it a 7.642/10. Good ride. I liked some of the loops, but I kept banging my head against the shoulder harness. 1 out of 6 are not good odds. And that one was pretty much Kirkbride sniffing glue. Well, CD Project Red has certainly thrown down the gauntlet when it comes to open world RPG design with The Witcher 3. Will Bethesda rise to the occasion? See, the real test is - is it as open and nonlinear as Ultima 6 or 7? Because I've yet to play something that is. Or with NPCs more lifelike. It's a 20+ year old game what's wrong with gamedevs? But no, seriously, every game Bethesda makes is blander and shallower(yet still sucking +300 hours from me), and every game they make sells better than the ones before. They've got no incentive to change the formula anymore. So, nerds gonna e detectives, but it's neat how close this game is to where I live. I loved the crap out of 3 for that reason(and NV was pretty good too). I'm stoked to play this...and may actually visit the area before playing just to get that nice sense of familiarity when walking about. I don't actually remember the last time Bethesda gave us a good rpg. I suppose you could point to Morrowind or Skyrim but there's cases to be made against those really being good rpgs. Will it be gorgeous? Count on it. 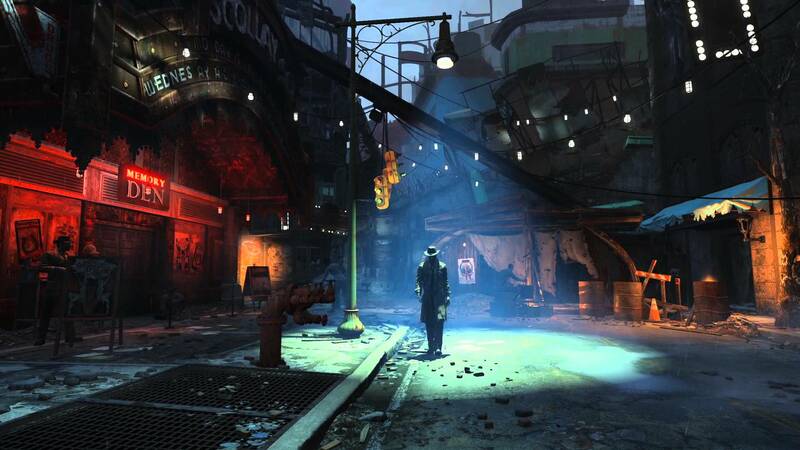 It'll be a really cool looking post apocalyptic Boston FPS game. I'm sure it'll get GOTY and sell hundreds of millions of dollars of copies worth. Bethesda is GOOD at that. They're not good at making good rpgs though. I do not have high expectations for the story (FO3 was really boring to me) as Bethesda has not made an intriguing story yet. Generally (as has been said) they're lazy generic fantasy stories or the characters are hard to get attached to. I'm sure it won't fit into the canon Fallout story either, but that's mostly irrelevant anyway. I also do not expect it to be any more interesting gameplay-wise than their pseudo bullet time VATS system from FO3. I'm sure there will be things to build and mounts and stuff to fly and craft and a DLC that offers red boots for $40 or something. But the hype train surprises me. Bethesda gives us the same flashy depth lacking games every time and people gobble them up. Wait, what's the argument against Morrowind? Is it just the old style d20 hit-miss weirdness? I suppose Morrowind doesn't really need to be included in there, but nostalgia aside, it's definitely got some of the same problems as the other Bethesda games do. Things like becoming godlike invulnerable once you hit a certain level, a really clunky inventory system, unreal brokenness when it comes to enchanting/magics. What makes Morrowind good is, in spite of all its flaws, it doesn't hold your hand with a compass arrow minimap and you are left to your own devices to navigate the world with a really crude minimap with fog of war, road signs, landmarks, etc. It's easy to get sidetracked into a dungeon that you just HAVE to go in because WHATS INSIDE and often it's a vampire lord or something who will punch you in the face. But screw those stupid flying things. Seriously. Voiced NPC/not seeing the exact thing your character will say... seems more "this is who you are" than previous fallouts. (1 - someone sent to save the vault. 2 - their child trying to save the village. 3 - child of an NPC, the most definite backstory to your character, but the character of your character isn't given. 4 - a courier whose pre-bulletwound life is a mystery) Hopefully there is a "no voice" option with fully visible dialogue prompts so I can use my own voice in my head. The world... well, I'm excited about this. It looks diverse and - so far - alive. I'd honestly settle for a main-quest-free game. The way I sees it, you start the game in to the 2270's as Fry in Futurama did with the year 3000 - lost and totally alone. Everyone you know is dead. Go and live in the world that you find yourself in. It'd be a bunch of "side quests", all just happening in the world. Some might effect the greater area, some might just have localised effects. Unlike all the other Fallouts so far, the PC this time has not got any predefined (to our current knowledge) motive. He doesn't want to find out about the guy who shot him in the head, or save the vault, or find dad, etc. Why artificially make one? Of course Morrowind has plenty of mechanical problems, though I don't really care when the story is so solid and intriguing. It has so many layers from the lowly farmer, to the house politics, to the gods, to the gods of gods, to the gods of those gods... Kirkbride is still writing for it to this day, as he said himself, "they won't let me stop." If you just interact with the game on the ground level of wanting to become powerful and kill the bad guy, then you'll run head first into the mechanical problems. But if you talk to everyone, try to figure out what all the weird names represent, read the books (all of the books have in-world authors, sometimes they're deliberately misleading, and there's rare/banned books or certain people in the world who know the score [who you might be tasked to assassinate]), then it's very interesting. The market for storytelling in games is pretty niche though. The money is in watering down and appealing to the masses. I concluded that the whole Morrowind vs Oblivion and Fallout 3 vs New Vegas thing comes down to that. The niche who will maybe accept compromises in gameplay for a compelling story, or the masses who want graphical improvements on a satisfying power fantasy. It's very difficult to appeal to both in a substantial way. Waypoint markers and instant fast travel are divisive as you noted. It's not always nostalgia that explains why older games have better stories either, I would say it's largely due to the industry growing and companies figuring out where the money is. Same thing happened in other mediums, in different ways but under the same principle. TV turned to reality shows, journalism to sensationalism and echo chambers. We happen to live in a world where Twilight and 50 shades are in the all time best selling books list, Avatar is the highest grossing film. What movies/books are considered the most critically acclaimed? Works from 50+ years ago. People can get depressed or angry about that fact but I just accept it and try to talk about the good stuff out there. Morrowind is good stuff if you're into rich fantasy worlds. Koa wrote: It's not always nostalgia that explains why older games have better stories either, I would say it's largely due to the industry growing and companies figuring out where the money is. Same thing happened in other mediums, in different ways but under the same principle. TV turned to reality shows, journalism to sensationalism and echo chambers. We happen to live in a world where Twilight and 50 shades are in the all time best selling books list, Avatar is the highest grossing film. What movies/books are considered the most critically acclaimed? Works from 50+ years ago. People can get depressed or angry about that fact but I just accept it and try to talk about the good stuff out there. Morrowind is good stuff if you're into rich fantasy worlds. Flawed argument, I hear this one all the time about music. Everyone remembers Pink Floyd, the Beatles, James Brown. No-one remembers Kenny. Good stuff has a self reinforcing reputation, people will start to like it because it's thought of as good, and it defines itself as good (Eventually). Bad stuff will fade into obscurity, or at least into a vast mass of other bad stuff. What's nice about Fallout 3/New Vegas/Oblivion/Skyrim is that they had the previous games to build on, so the worlds themselves had a lot of depth. The main stories lacked depth and were all pretty short. However, with the vastness of the worlds, you can easily log 200+ hours in the games while still having plenty more to do. That scale is honestly my main draw to these games, and the reason why I will probably get Fallout 4, even though I know I am going to have a lot of problems with the game itself. What I'd like to see them fix is the problem that Fallout 3, Oblivion, and Skyrim all had in that they make it really hard in the beginning and then it gets really easy towards the end. It needs to be a bit better in that respect; getting better equipment should be necessary to deal with more powerful enemies, not simply something to make you nearly invincible. Personally, I would make both the player and the enemies a lot easier to kill while making ammo a lot more scarce; seriously, even though it is large for an insect, it shouldn't take 3-4 .32 caliber rounds to kill a bloatfly regardless or your skill with the weapon or that weapon's condition. Having the imbalance between you and your opponents either limits the tactics if they take too much to kill since it becomes about just unloading as much ammo into them as possible or makes them unnecessary when you can just stand still and while only losing 20% of your health. Thesh wrote: What I'd like to see them fix is the problem that Fallout 3, Oblivion, and Skyrim all had in that they make it really hard in the beginning and then it gets really easy towards the end. It needs to be a bit better in that respect; getting better equipment should be necessary to deal with more powerful enemies, not simply something to make you nearly invincible. . Unfortunately, the nature of the open world rpg genre sort of puts them between a rock and a hard place on this count. The other option is to set up the map in such a way that the player progresses to new and harder enemies at the same time that they become more powerful. But this implies a level of developer control over where you go and who you fight that cuts directly against the idea of an open world. New Vegas made some steps in this direction (dividing up the map with impassable mountain ranges and putting a big nest of deathclaws between you and the bright lights of the big city, essentially forcing you to take an easier scenic route for the first few hours of the game) and it's not hard to find lots of people complaining about how Obsidian had clearly failed to understand how open worlds were supposed to work. So you can disagree with how Bethesda and Obsidian have chosen to trade-off between progression, balance and openness (it sounds like you want less progression and more balance) but it's important to recognize that they're in direct tension, and there's no free lunch that will give you all three. More balance, yes, but less progression? Not at all. I'm adamant about enemies getting much stronger as you go on; Fallout 3 had the perfect mechanism for this within the story: the Enclave. At low levels, you can fight lots of Raiders, and then as you move forward you have guys with energy weapons and power armor wandering the land. I'd be happy if the Raiders got easier and the Enclave got harder. From about levels 10-20, there are plenty of one-shot-kill enemies, and I don't see why it makes a difference if a bloatfly takes one or four shots at level 1. I also don't have a problem with having some enemies you can't deal with at lower levels. I mean, when I first came across Old Oney in Fallout 3, I ran away with my tail between my legs and came back later; perfectly acceptable to have those areas. It's just when there is next to nothing that can kill you in the end (well, Broken Steel adds some extra difficulty here, although a Super Mutant Overlord appearing in a hallway when you are just getting to the point where you can take on regular Super Mutants was pretty frustrating - they should have left them for level 20+), and there is not a single enemy that is not a hassle at the beginning (especially when ammo is hard to come by), it makes everything feel off. My biggest problem is that combat on lower levels tends to be frustrating (which kills immersion for me), where on higher levels it's boring. There's a huge in-between there that doesn't require turning it into an action game or reducing the amount of progression. wst wrote: Flawed argument, I hear this one all the time about music. I think that caused you to miss my point. I'm not making any argument of bad vs good, but good vs capitalism. Bigger audience, broader demographic, more money. "The key to failure is trying to please everyone." Music doesn't fall into that problem nearly as much since it's so abstract, which is why I excluded it. Good music is more defined by the culture it was created in and the impact it had on that culture than anything else. A good story is fairly timeless. Different beasts. I otherwise don't understand what you're saying. Thesh wrote: My biggest problem is that combat on lower levels tends to be frustrating (which kills immersion for me), where on higher levels it's boring. There's a huge in-between there that doesn't require turning it into an action game or reducing the amount of progression. All of the survival mods I had for Skyrim fixed that for me. In the beginning you don't really need survival supplies because you start the game fully healthy and in a nice climate next to a town. Once you level up a bit you're going to need to start gathering supplies to start journeying. The deeper you get into the game the more you're wandering in and out of the harsh wilderness, and even though you might be fighting ancient dragons and whatnot, there's still the thought in the back of your head that you could die of hunger/dehydration/passing out from exhaustion/hypothermia/bleeding/infection/etc. You always feel that basic vulnerability despite also progressing in power. It keeps you grounded. Your resistance to the elements also levels a bit with you so that it doesn't feel like an unsuitable burden. I'm saying that things that look for more money have always been around and that the bad ones from way-back aren't as easy to remember - or fogged with nostalgia. Though I suppose as a relatively young industry (books were figured out centuries ago, TV a few decades) we have the good fortune of watching the evolution of the medium, the rapid explosion of all sorts of things that sort of work but are outcompeted in the jungle by the taller trees that catch the financial sunlight better. As for difficulty scaling/The Enclave in FO3... I find it quite entertaining that Bethesda, with their famous writing skills, managed to plotline-in a good way to make enemies stronger as the game goes on. Could it be plotlined-in more generally? Raider encampment you'd see between levels 1 and 10 might have 5 raiders in with fairly crap equipment, between 10 and 15 you might see some other raiders on a road nearby, with ok equipment of their own, stealing good equipment from a Caravan, and then at 15 onwards you'd see the original 5 raiders with good equipment and the thief raiders from 10-15? Assuming that you let any of them live. Maybe you killed the first 5 raiders, but don't see the thief raiders raiding the caravan, and so you'd find a raided caravan and only the thief raiders alive in that raider encampment? Maybe you leave the first 5 raiders and kill the thief raiders later, and the first 5 raiders never get better equipment or extra support? They tried that, remember? Oblivion? Bandits in Daedric Armor demanding 100 gold from you. It was ridiculous then, and it'd be ridiculous now. A gang of humans packing equipment to be a challenge to someone wearing and wielding several lifetimes worth of value wouldn't be a raider gang, they'd be running a town. They'd have a "pet deathclaw". To plotline-increase the difficulty of enemies, you kinda need a good reason why. Invading army makes a good one. You leveled up three times in the last vault doesn't. SecondTalon wrote: They tried that, remember? Oblivion? Bandits in Daedric Armor demanding 100 gold from you. Er, nope, I haven't played any TES games, and it doesn't sound similar. At all. Raiders establishing some kind of settlement isn't a good reason? Obviously it wouldn't be the only way of progressing enemies as a plot-point, it wouldn't be a big wave of raiders suddenly covering the map with better stuff, and it wouldn't all be at the same time, and it'd have gameplay-changeable effects (it wouldn't play through the same way every time). What it also offers is an explanation for the Raiders suddenly getting decent weapons and armour, rather than them just getting better weapons and armour. Oh and a feeling of life, of the wasteland not being an unchanging bleak thing. They might build fortifications in time as well. Levelling in my example was entirely as some sort of timekeeping, rather than doing it by set dates, as people play through and explore the game at different speeds. So ok, it might not be the best idea, it took about 30 seconds to fully conceptualise and another 30 to type. But it's frickin' miles from "oh they mysteriously pulled laser rifles out of their butts and MF cells rained from the sky". In the first Fallout, there were a couple of unspoken timers and some spoken ones that changed based on your actions. Point being that lots of people found the idea that supermutants would always overrun your vault after X days terrible as they wanted to just freely screw around. So patches extended the timer out so far as to practically no longer happen. Alternately you can also end up with wacky situations where you essentially walk through a perfectly normal, functioning town, talk to one guy in a bar and exit to find the town's been wiped out because you triggered the right flag in your conversation. That's also not fun. It's a weird balancing act, frankly. And it's hard. FO3's was neat, but also done before. The entire plot of FO3 was kinda like a weird retread of 2 with some elements of 1 thrown in, only a little less clever. But it worked, and was a pretty amazing game, from a exploration point of view. I mean, for how fucked up FO3's world was, it's also been 200 years. Humans should have done way, way better in that timeframe, especially with Supermutants breathing down their neck. Hell, it probably should have been two competing governments, maybe three (Nukers, Riveters, and.. I dunno, Dave's) that then form a rough alliance with the Brotherhood against the Enclave when they showed up. *shrug* If you want to make a good game that doesn't appeal to a lot of people, for whatever definition of good game you like, you can. Plenty of indie games out there, some of which even find niches. Generally, though, the triple A games cost a lot to make. They do not exist at all without capitalism and at least a shot at a broad audience. I do agree that auto-scaling by itself is kind of crap. It's not *necessary* for mass acceptance, though. The sheer popularity of Fallout 3 indicates that people were pretty okay with that somewhat disguised method. And of course, you've got some of the DLCs as rather difficult, which you are unlikely to encounter right off. So, that mostly makes sense, albeit it got a little odd when the redneck island was way more lethal than people basically anywhere else...but in principle, it can be made to work. That was basically my point... Bethesda is after the larger market. Koa wrote: That was basically my point... Bethesda is after the larger market. But there isn't really a "good" alternative here in terms of choice. You're not going to make a game like Fallout for a niche market. So it's not Good v Capitalism. It's This v No Game. One way you could write an RPG is to make it episodic. And give players control over when an episode ends. Maybe even limit the impact of "leveling up" during an episode. As an example, imagine a generational game. Episode 1: Break into the vault before the bombs arrive. Episode 2: Earn the trust of the vault members before they kick you out. Episode 3: Descendent of the first Hero. There is Chaos in the Vault! Get out before it gets bad. Episode 4: You arrive in the wasteland. Make a place for yourself. Episode 5: Descendent of the 2nd Hero. Some crisis has erupted! Save the town. In each phase, there are side quests you can ignore or not. You could even have a system where you can "go back" to a previous episode and do more quests, earning more XP/perks/gear for your *later* incarnations, or maybe changing part of the world (tricky). This helps prevent "finish everything" -- going to the next phase doesn't prevent you from later finishing an earlier phase. The "go back" option means that changes earlier might be limited, sadly. So maybe not. But the idea is that you can reuse the same terrain, and but different. And with power-bands on each of the episodes (you can only get so tall in an episode), they can control how hard things get. Your first character is a hapless citizen. Your second character is a seasoned vault-dweller, the descendent of the refugee, but knows nothing of the wasteland. Your third character is a community leader, the descendent of the vault-dweller, and knows the area around the settlement. The 4th character is the child of the person who saved the town from a massive crisis. Each gets attributes/skills from the last generation (passed down teachings), and gear (your mom's power armor). You *start* near skill cap of the previous episode's character. Honestly, that would have been sufficient for me to not find the game frustrating on lower levels (the ability to kill enemies faster greatly improves your tactical options, even if they can kill you faster) and not feel immortal on higher levels, but still not frustrating (which it would be if everything leveled to the player). There are almost certainly mods that do all those things. Rebalance mods tend to be released pretty darn early too in my experience. Chen wrote: There are almost certainly mods that do all those things. Rebalance mods tend to be released pretty darn early too in my experience. Unfortunately, I played on the Xbox 360. Look, if you are determined to play a bad game, we cannot help you. So in the E3 demo our protagonist starts in the pre-war world, then wakes up apparently un-aged 200 years later, with their last memory being watching the bombs drop outside the locked door of a vault. Weird, huh? What could cause that? Well one thing that could cause that is if your character actually died on the day the bombs dropped, and the character you play as for the rest of the game is actually an android implanted with those memories, and made to look exactly like your pre-war self. We already know from Fallout 3's Replicated Man quest that all of these things are possible and even routine with the technology of the Institute. And the Institute is located where? Oh, right, Boston. You heard it here first, the main character is an android. Didn't the vault from Fallout 3 with the VR simulation have stasis chambers? The latest gameplay video makes the game look more like an action RPG similar to Mass Effect. It might end up feeling like a very different game for the series but my concerns are the same. The power armor is very cool though. I would hope that they can be taken out into the world with downsides like being unable to loot, because otherwise it's going to be a setpiece vehicle. It's a setpiece vehicle isn't it? The way he grabs the chain gun and falls off a probably inaccessible building into a bunch of enemies... It's an action FPS with RPG elements. You say that like 3 wasn't. I went into the video expecting "take cover to heal" or something. To me, it doesn't seem much different from FO3/NV except that it appears to have more emphasis on scripted events and the power armor acts like a vehicle rather than equipment that you would wear permanently. I don't think that focusing on the action and presentation while further dumbing down the RPG side is necessarily a bad thing, of course FO3 did it first, but this is unexpected for me. It makes a lot of business sense, it's the safest way to progress things. I'm not sure it fits Fallout though. There might not be any skill check dialogue options anymore. There might not even be skills -- I didn't see anything in the pip boy. Well, I don't feel too strongly about it. I've already conceded that territory. I feel like the proverbial Zen master every time the new Fallout game comes up in conversation. As a long time fan of the series, all my friends want my take on every new piece of information that comes out. "Hey, don't you think this latest trailers makes Fallout 4 look like it's going to be the best?" Hey, Don't you think this latest trailer shows Bethesda is ruining the Fallout franchise?" Honestly, from what I've seen, the game looks fun, definitely something I'd want to play. But we're just not going to get enough context to judge whether it's going to be a worthy successor to the Fallout franchise from marketing materials alone. EdgarJPublius wrote: But we're just not going to get enough context to judge whether it's going to be a worthy successor to the Fallout franchise from marketing materials alone. Hell, there's 8 Fallout Games if you include the new mobile one. Lots of people cannot even agree that more than 3 of them were worthy of the name Fallout. I mean, there were arguments that Tactics could never be a real Fallout game because it didn't take place in California. At any rate, I agree with the sentiment.